Here is the next generation of functional Maine influenced sire to target female production. This bull is extra hairy, huge boned, deep sided, sound structured and is backed by some outstanding Simmental genetics. The Imprint females need no introduction. He left his legacy in terms of a maternal sire. The combination of Irish Whiskey sons on the Simmental line of cattle is phenomenal in terms of production oriented traits. 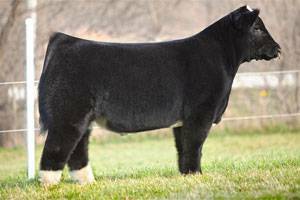 This bull lines up some of the most sought after efficient and economical Maine cattle. If you are looking for a soft made big footed Maine bull to generate replacements with hair and substance, this bull has the most potential of any!